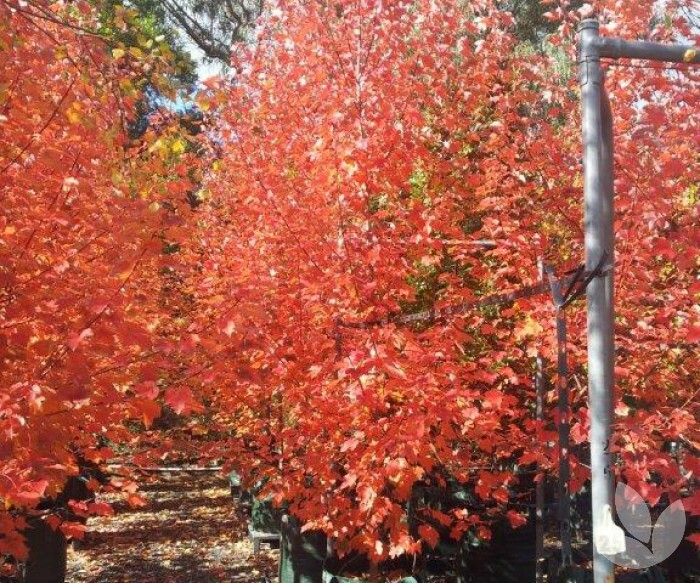 'Autumn Red' is a great name for this Canadian Maple. 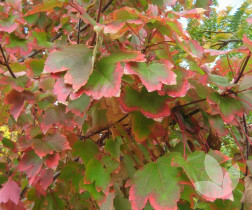 All parts of the tree, including flowers, twigs and seeds, are various shades of red in Autumn! 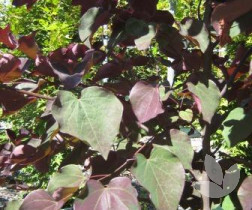 It is a beautifully rounded tree, and great for Autumn colour, although its leaves stay green longer than other varieties before turning. We have great stock ready to view and plant now in 40cm and 50cm containers, and 100 and 150 litre bags if you are looking for immediate impact! 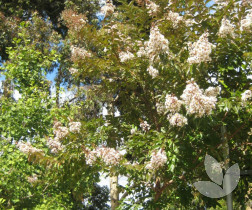 Growing 6 metres tall x 4 metres wide, this native is fast growing and can be grown as a shrub or small tree. It has a slightly broader leaf than straight Acmena smithii and a semi pendulous growth habit. Growing all the way to the ground, it makes an dense hedge very quickly. 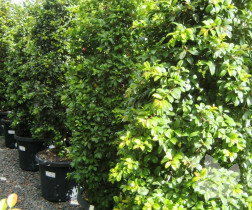 Talk to us now about stock available for planting in 40cm and 50cm containers. 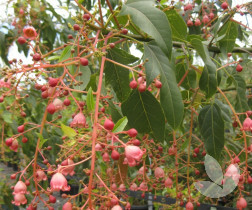 Brachychiton 'Bella Pink' and 'Jerilderie Red' along with their smaller sibling 'Bella Donna' are three specimen trees that have been specifically grafted for domestic use. They each offer great flower colour particularly in summer, glossy green foliage and a versatile compactness that now lends itself to residential developments. Click the individual links for more specific information. We have good numbers of each variety in 30cm, 40cm and 50cm. At this stage we still have larger specimens of 'Bella Pink' in 100 litre bags but you will need to be quick to secure. This small attractive tree is one of our favourite trees and we find it very popular in design circles too. With magnificent large heart shaped burgundy coloured leaves that continually change colour throughout the year it is no wonder why it is so popular. We currently have great material to suit heights from between 1.6 metres to 3 metres tall ready to go now in 40cm and 50cm containers and 100 and 150 litre bags for instant impact. 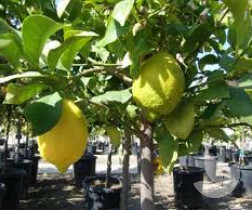 Not many people know we grow citrus and it is a line we have gradually increased over time. Speaking of which, now is a great time to plant citrus and we have a good selection of lemons (Eureka, Lisbon, Meyer), limes (Tahitian, Sublime), oranges (Washington Navel, Valencia) and mandarins (Emperor, Imperial) to choose from. For more information on individual varieties, please click their link! All the varieties we grow are currently available in 30cm containers, but if you are looking for something a little more substantial, we do have 'Eureka' Lemon, 'Emperor' Mandarin and 'Washington Navel' oranges also available in 100 litre bags. Also known in the market as Corymbia citriodora 'Sensuous', this tree has heaps of potential in the residential landscape. Slightly oval or narrow domed, it has an attractive smooth mottled trunk and salmon-pink coloured bark. And it doesn't shed its branches! A favourite in the nursery for its form and aroma, we love the intensity of its lemon scent when its leaves are crushed. Talk to us about material for supply now. Our 40cm and 50cm container stock is currently between 1.8m and 2.5m tall and ready for planting. This could be a tall spreading shade tree, but mostly we see this tree ordered for its thick foliage and suitability for instant hedging and screens. 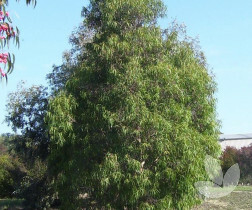 A small fast growing tree to 10m it has attractive foliage that consists of different shades of green. We have material ready to go now in 20cm and 40cm containers. Another favourite, Lagerstroemia cannot be beaten for its beautiful growth habit, open form and floriforous nature. 'Natchez' has spectacular white crinkle like flowers, but at the moment you can also choose from 'Tuscarora' with it's promise of hot pink flowers, and 'Sioux', which produces flowers that we describe as a vibrant musk pink. 'Natchez', 'Sioux' and 'Tuscarora' are all currently available now in 30cm, 40cm, 50cm as well as 100 litre bags. 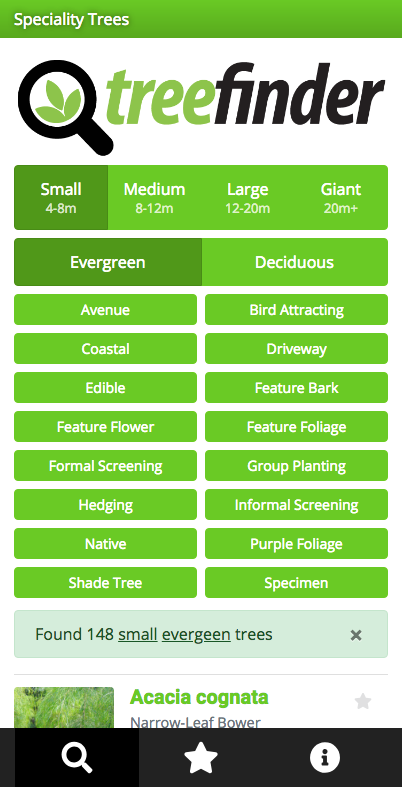 Looking for that eye-catching shade tree in summer? Well now is the time to plant! 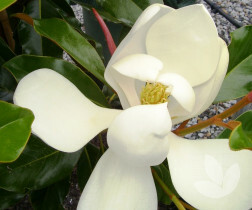 Above is the magnificent flower of Magnolia grandiflora 'Kay Parris', a beautiful dense tree with small dark green glossy leaves that have a slight wavy edge to them and brown velvety underside. These features are also present in a number of other magnolias on offer now such as 'Exmouth', 'Little Gem' and 'Teddy Bear'. All vary slightly in flower size, leaf shape and form but all make great garden specimens. And Magnolia makes a wonderful informal screen! Talk to us now for material in 30cm, 40cm and 50cm containers. 'Exmouth', 'Kay Parris' and 'Little Gem' is also available in 100L and 150L bags as well. 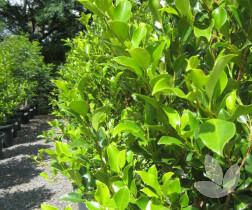 'Pinnacle' is a tight-leafed Syzygium ideal for hedges and screens in narrow places. With glossy deep green foliage, this variety could also be used as a feature, like Italian pencil pines, down a driveway or footpath. 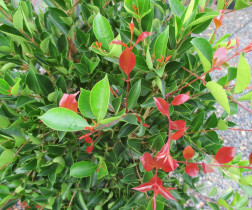 Other Syzygium options for the same purpose are 'Hinterland Gold' also with compact glossy green foliage and a lovely copper hue in its new growth, and 'Select Form' with a more rounded leaf and bronze colouring on new growth. All are great for formal hedging. 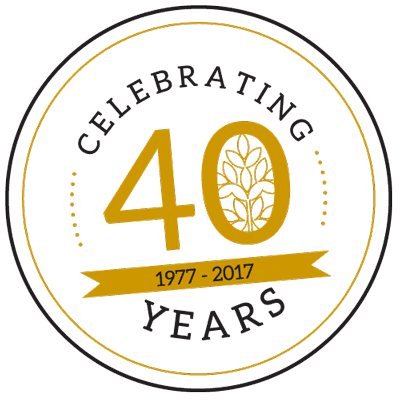 'Pinnacle' is available now in 20cm, 'Hinterland Gold' in 20cm, 40cm and 50cm containers and 'Select Form' in 20cm and 40cm. 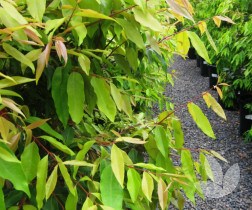 This is a popular take on the straight Tristaniopsis laurina which features larger and shinier dark green leaves and new growth that starts out a distinctive copper colour. Over time branches develop a deep purple coloured bark that peels back to reveal a cream smooth trunk. It produces somewhat fragrant yellow flowers in clusters in summer. In short supply of late, we have good numbers available and ready to be planted now in 40cm and 50cm containers. Growing 8m tall x 5m wide, this tree makes a wonderful statement either as a stand-alone feature or large informal screen. It has a wonderful full form and weeping habit with narrow linear leaves that are various shades of green. 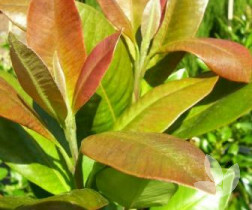 New growth is an attractive and distinctive pinkish-green colour. A very popular line and a variety exclusive to us, 'Whisper' is available in multiple sizes across the year from 20cm through 50cm to 300 litres.